Attention right now is understandably on Apple’s newly announced iPhone 7 and Apple Watch Series 2, but the company has also taken the time to quietly increase the storage tiers across its iPad lineup while also dropping the price on the Apple Watch Series 1 – a refresh of the existing model – giving buyers an entry-level option. Starting with iPads, Apple has today revised all iPad lines to more closely reflect the storage options of the newly announced iPhone 7 and iPhone 7 Plus. That means that the iPhone mini 4, iPad Air 2 and both iPad Pro models are now available in a variety of 32GB, 128GB and 256GB flavors, with 16GB options no longer for sale. 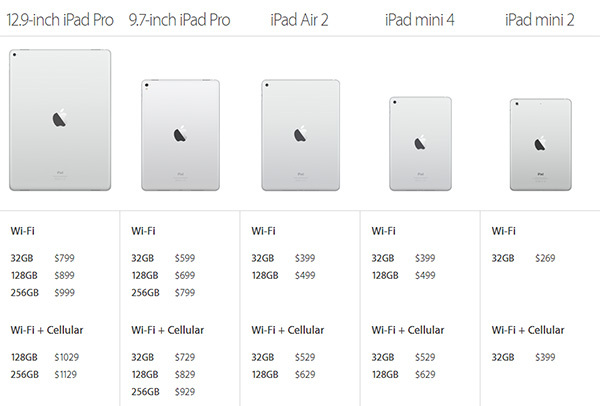 Following today’s storage changes, the iPad Air 2 is now available in 32GB and 128GB storage choices, priced at $399 and $499, while the smaller iPad mini 4 available with the same storage and price combinations. All users need to do is choose the capacity and screen size to suit, with no difference in price across the two screen sizes. Those who want something a little more powerful can opt for the iPad Pro, which has seen a price cut as well. Those looking for an iPad Pro can choose from the 9.7 inch Wi-Fi model, costing $599 for 32GB, $699 for 128GB, and $799 for 256GB, or the 12.9 inch, which now costs $799 for 32GB, $899 for 128GB and $999 for 256GB. 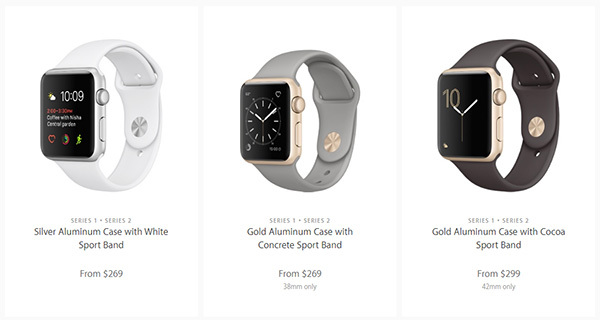 Apple’s newly renamed Apple Watch Series 1, or last year’s Apple Watch, but with a new dual-core CPU, is Apple’s new entry-level wearable and will set buyers back $269. The revamped Apple Watch will not feature the GPS capabilities of the Watch Series 2, but the inclusion of the dual-core chip should not be underestimated. Apple today announced all-new hardware, excluding Macs and iPads, and as yet, it’s unclear when we can expect those two lineups to receive hardware refreshes. Both are getting ready, especially the Mac, so hopefully Apple will turn its attention to its computers now that the portables are ready for primetime.